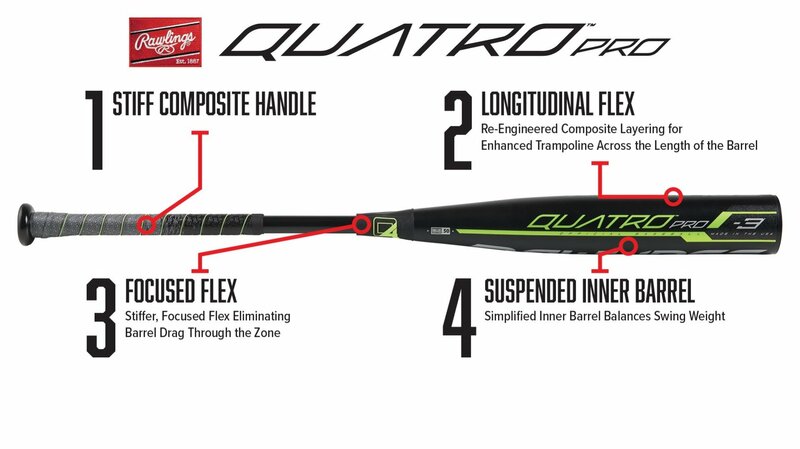 The 2019 Rawlings Quatro Pro BBCOR Baseball Bat (BB9Q3) features a standard 2 5/8-inch barrel diameter, and a -3 length to weight ratio. Step up to the plate with the Quatro Pro BBCOR bat and you'll see hits that travel farther and faster. With the Longitudinal Flex feature it means having more composite layering on the inside of the bat to produce a trampoline effect across the barrel for a greater push. Combined with a Suspended Inner Barrel that provides a balanced swing weight to help players increase their bat speed.